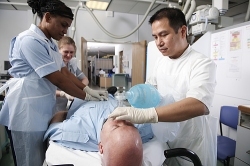 Not every medical or health care professional would be competent in resuscitation, sometimes those without recent acute or emergency care experience would be uncomfortable performing Basic Life Support (BLS). However, it is crucial that those with professional registration are able to manage medical emergencies and perform resuscitation appropriate to their expected clinical responsibilities. Here at JMS, we understand the need for you to have this required training, yet also recognize that this training is often something seen as an inconvenience. That’s why our training for health care professionals ranges from a 3 hour Basic Life Support (BLS) course to Resuscitation For Health Care Professionals, which can be adapted to the equipment available to you, from manual or automated defibrillation to immediate airway management techniques and safely and effectively suctioning the airway. Call our clinical training team on 01244 380 699 for more information or to book your course!